Reason for Stay: Recovering from a stroke and fall. Kenneth Monahan arrived at Gallatin Center after suffering a fall at home. This event happened just as he was recently discharged from another skilled nursing community. Kenneth suffers from chronic pain, obesity, and reports having a stroke seven months prior. Upon arrival, Kenneth required two people to help him get in and out of bed and required a lot of assistance with bathing and dressing. Being unable to walk at first, Kenneth quickly progressed to wheelchair level then progressed to walking with a rolling walker up to 200 feet with contact guard assistance! Kenneth gained a lot of strength, endurance, and balance. His variety of exercises that included balance training was implemented by his therapist. During his stay with us, Kenneth lost 35 pounds! Kenneth made a significant improvement with physical and occupational therapy. We are happy to say that his hard work truly paid off. His overall health improved while staying here with us. As he was discharged February 1st, we miss his friendly smile and amazing attitude, but we wish him all the continued success he has so greatly worked for! Gallatin Center Celebrates Heart Health Month! Our community proudly welcomed Amanda Maples, RN, BSN, and the greater Sumner County community for our annual Heart Health Seminar! Led by Maples, the discussion focused on the topic of “Knowing Your Numbers!” Guidance was provided in regards to the significance of being aware of your blood pressure, resting pulse rates, genetic dispositions, and vitals at all times. All in attendance were treated to fun swag, yummy treats, and state-of-the-art educational material! Posted in News and Events, News and Events	| Comments Off on Gallatin Center Celebrates Heart Health Month! How did this patient hear about Gallatin Center? Hospital referred her. Tabitha Knight (a.k.a Toby) entered our community on October 17th, 2018, following a hospitalization for shortness of breath and difficulty breathing. She was diagnosed with chronic respiratory failure, fluid overload and COPD, resulting in a decline in function and therefore requiring short term rehabilitation in order to safely return home. When arriving at Gallatin Center for Rehabilitation and Healing, Toby was greeted by her nurse, Rosalyn, CNA techs Santos and Mirabelle, and Billie, the concierge. Over the course of the next few days, Toby met with several other department managers in dietary, activities, and therapy to discuss menus, daily activities, and treatment plans for recovery. At the time of her evaluation, Toby required minimum assist for mobility and transfers and maximum assistance for bathing, dressing, and toileting. She was able to walk 20 feet. Her first week of therapy was focused on safety, and she increased her walking distance to 40 feet, double from where she started. In week two of therapy, the focus was on her strength. Her walking distance increased to 100 feet. She also went to minimum assistance for bathing, dressing, and toileting. In weeks three to five, she has worked on balance, endurance, and functional mobility training and has been progressing well. She can now walk up to 150 feet at a time and no longer requires assistance for all functional tasks. Toby has been a pleasure to work with. We are proud of her hard work and we are happy to assist her! On June 26th, Judy Rich was transferred from Sumner Regional Medical Center, arriving diagnosis of a tibial plateau fracture in her right leg. When arriving at Gallatin Center, Judy was greeted by her nurse and the community’s concierge. Throughout the next few days, Judy met with several other department managers in dietary, activities, and therapy to discuss menus, daily activities, and treatment plans for her recovery. When Judy began therapy, she was dependent on transferring due to her leg fracture and it being non-weight bearing. It became very hard for Ms. Judy to do many tasks for herself and it was very frustrating. With time and diligence, the therapy team worked with Judy until her cast was taken off. Once the cast was taken off the therapy team began to try several different exercises to build her strength back up. Judy is now able to do some daily tasks for herself with the assistance of one and is now being able to take twenty steps. Judy’s favorite part of being at Gallatin Center is being around the people and working to get her strength back. Judy plans to be discharged on October 16th to go home. We are all happy that she is going back to her home and we send best wishes and prayer as Judy continues to grow stronger. Posted in News and Events, News and Events	| Comments Off on Nursing Home Week 2018! On October 1st, Bobbye Allen was transferred from Sumner Regional Medical Center with an arriving diagnosis of pneumonia . When arriving upon admission at Gallatin Center, Bobbye was greeted by her nurse and techs. Throughout the next few days, Bobbye met several other department managers including that of the concierge to discuss recreational programming, menus, therapy, and person-centered evaluations to get to know Bobbye as an individual and what her interests. When Bobbye began therapy, she was dependent with transferring and assisting herself to daily needs and desires, with the help of the stellar therapy team including that of Lordez, Kacey, Robert, Jessica, Bridgett , and Cindy! Over the course of the weeks to follow, Bobbye is now able to complete daily tasks with only minimal assistance and verbal cuing. Bobbye’s favorite part of being at Gallatin Center was the pet therapy program as she was able to spend time with the friendly fury friends that visited her room at her room. Bobbye looks forward to returning home, but she shared that Gallatin was “a very nice place and the people are very friendly here.” Bobbye plans to discharge home on Tuesday, December 5th. We are all thrilled that she will be able to spend the holidays at home with her loved ones. Best wishes, Bobbye! We pray for continued health, success, and strength for you in 2018! On September 22nd 2017 , Margie Wheeler was brought by ambulance to Gallatin Center for short term stay. Upon arrival, Margie was greeted by her nurse and some of her techs. Throughout the week, she met several other department heads such as the concierge department to cover any questions, discuss recreational programming, menu for meals, and personal information about Margie so the team could create a comprehensive care plan to best suit her journey of healing. Margie stated to me “the therapy group has been really good, I can walk and breathe better even with my COPD, everyone has been really good to me and I would recommend this place to anyone.” We are all happy Margie will have the opportunity to return home on November 1st to be with her family as a stronger person. We all loved having her here, but thankful she has improved to go home. We wish the best wishes to Margie! Gallatin Center for Rehabilitation and Healing is proud to share that they are a recipient of this year’s Silver National Quality Award from the American Health Care Association and National Center for Assisted Living (AHCA/NCAL)! Gallatin Center was one of only six post-acute care providers in the state of Tennessee to be invited to this year’s award class. The Silver award is one of three progressive recognition levels through the American Health Care Association’s National Quality Award program. 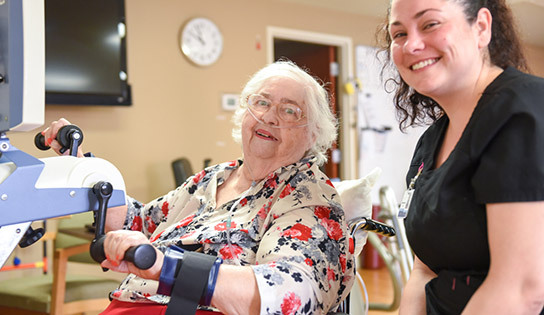 The platform recognizes through a nationally-accrediting body, those who have made an incredible commitment to improving the quality of care for seniors and those with disabilities.